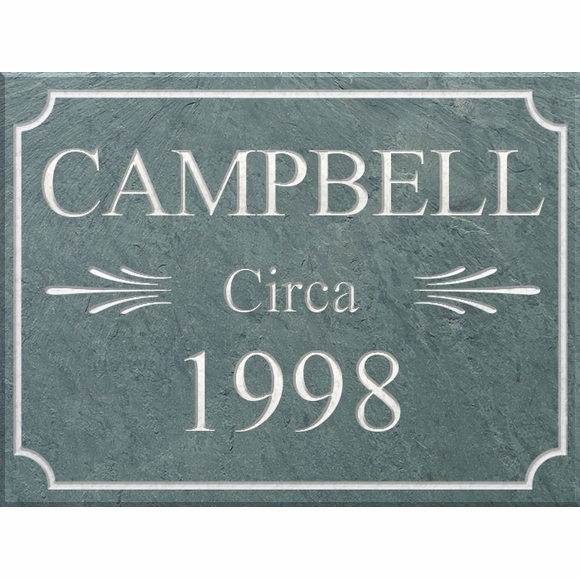 Personalized Slate Historic Sign - - rectangular plaque for historic buildings, homes, sites, or your family with lines for the site or family name, the word "circa" or "built," and the year of founding, building, or dedication. Made in USA. Line 1 holds up to 15 characters (including spaces). all the letters on this line are capital letters as shown. Line 2 contains either circa or built and the design accent as shown. Line 3 holds the historic year. Available in two sizes 9" x 12" and 10" x 14" and in four different color combinations. Understated yet beautifully finished plaque. Perfect addition to our 1825 home! Shipped quickly and securely. Thanks!